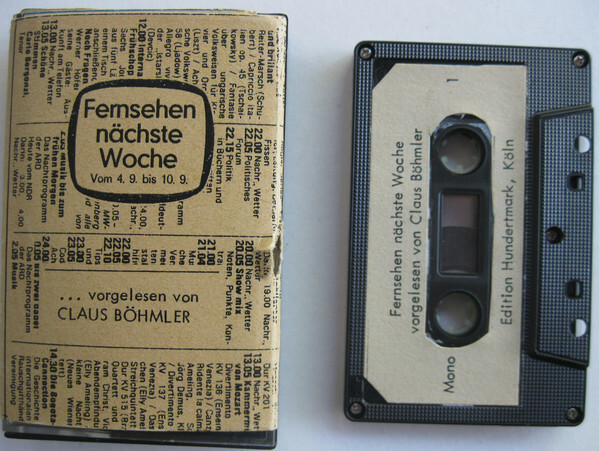 A tape recorder cassette with a run time of 31 minutes and a small booklet. Born in 1939 in Heilbronn, Claus Böhmler was a German artist whose artistic practice spanned sculpture, installation and video, and whose oeuvre demonstrated frequent use of modern techniques of image-making. He studied at art academies in Stuttgart and Düsseldorf. He took an early interest in reproduction – readymades and sounds have remained a crucial part of his work since the early 1960s. Böhmler is internationally recognised and has had an enormous influence on the post-war German art scene. Not only are his works widely exhibited in the country but also in other parts of the world.